In the fullness of time, the ’70s have come to seem (to your humble chronicler o’ events, at least) like a golden age of jazz, possibly because that was when I was discovering the music. The thrill of the new sticks with you. Back in the ’70s, some of my favorite recordings were duos — a format that, besides being inexpensive to record and a reflection of the influence of the AACM, also tended to throw the performers’ individual contributions and interaction between them into brilliant relief. Another recording from the period I recall today with some fondness was pianist Anthony Davis’ Of Blues and Dreams, which, atypically for the time, was largely through-composed, a finely wrought set of chamber jazz. 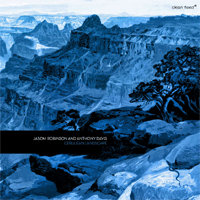 Davis went on to compose operas and teach at universities, but the latest batch of Clean Feed releases includes this 2008 date that pairs him with multi-reed man Jason Robinson, with whom he’s been duetting since 1998. For the most part, the pieces that Robinson and Davis prepared for this set are almost Ellingtonian in their lapidary elegance and beauty, highlighting the richness of Davis’ chordal voicings and Robinson’s big, brawny, Ben Webster-ish tone on tenor. On Robinson’s “Vicissitudes (For Mel)” and the impressionistic title tune from Of Blues and Dreams, which they revisit here, the two men evoke the spirits of Cecil Taylor and Jimmy Lyons. The theme to “Andrew” (which could be a dedication to Mr. Hill, I suppose) has a Monkian angularity. A nice surprise.